The main talking point about My Awesome Cafe is that it is located in a building at Telok Ayer Street that used to house a Chinese medical hall. The facade of the shophouse still has the prominent signs and wall engravings of the Chung Hwa Free Clinic. If you miss the small chalkboard sign at the entrance of the cafe, you need to walk inside to know for sure that you are in the right place. The interior decor takes a vintage industrial theme – using water pipes, old school desks, metal stools, retro wall fans and pieces of furniture made from pipes and vintage wood.We visited the cafe on a Sunday morning. There was an eclectic mix of people there – chatting away, drinking beer (yes, they serve alcohol in the mornings), typing away on their laptops or reading their papers. Music was loud and there was a certain relaxed charm about the place.The staff wear T-shirts which say “I Am Awesome” and they try hard to be “awesome”. They brought out a small cake with lit sparkles and sang “Happy Birthday” heartily to a lady having brunch there with her family. The food served at Awesome Cafe was basic with simple dishes like scrambled eggs, sandwiches, quiche and salads. The Croissant with Scrambled Eggs and Ham was nice and decent value at $8. 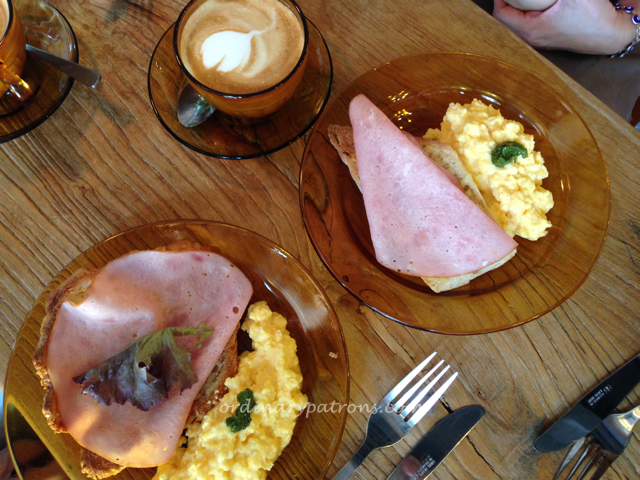 We also ordered the Bread with Scrambled Eggs, the Brie and Honey Glazed Ham Sandwich and the Awesome Sandwich. They were certainly not awesome. The Awesome Sandwich is really just a platter of four different sandwiches. They looked like what young schoolboys could hurriedly put together when they were hungry. The bread was a little too chewy and the crust too hard for our liking. We did not see dessert items in the menu other than the “desserts of the day” which no one told us anything about. Anyway, we were too disappointed with the sandwiches to stay for desserts. Average price per person for brunch -$18.